A few weeks ago, hundreds of people, most of them white, gathered in Lincoln Park to celebrate Peace Fest, which featured DJ sets, jam bands, and enough open marijuana smoking that passersby on surrounding streets could get a contact high. Not that anyone was complaining. 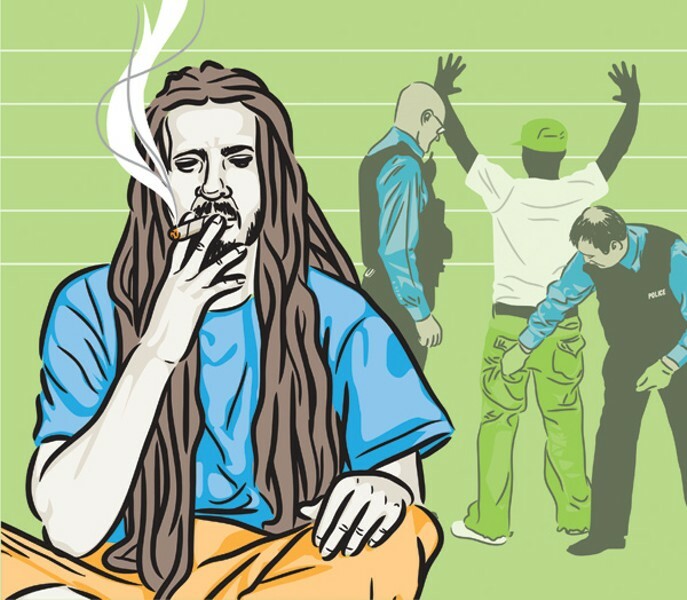 In their arrest reports, police often offer colorful narratives describing how and why they made marijuana possession busts. Some people get nabbed for doing really boneheaded things in public places (it's never a great idea to urinate in a park, especially if you're carrying a blunt). Other people are caught burning one down after burning through stop signs or red lights. And many are simply rounded up for being in what police designate "a high narcotics area." Here's a sample of the reports we reviewed. Arrested for talking with friends while black: "Subject placed in custody after being observed standing in a group of male blacks on a street corner known for narcotic sales before walking off from street corner down the block where he was observed discarding a plastic bag to the ground. Bag was recovered and found to contain 13 bags of cannabis." The potato-chip-bag caper: Officers saw a vehicle "commit minor traffic violation. Driver was asked to step out of the vehicle. [Officer] then observed offender seated on rear passenger side of the vehicle reach inside his right coat pocket and place light blue Lays chip bag on the seat next to offender. [Officer] recovered light blue chip bag and recovered from inside the light blue chip bag 17 small zip lock bags containing crushed green leafy substance suspect cannabis." The confession: Officers saw a driver run a stop sign then fail to signal while turning from 68th onto Elizabeth. Officers "attempted to curb driver and vehicle at which time driver/arrestee fled from the vehicle on foot leaving the vehicle running with the keys in the ignition. [Officers] pursued arrestee on foot into the rear yard of 6754 S. Racine where [first officer] observed arrestee throw a knotted plastic bag into the yard. [Once in custody, arrestee said,] 'I'm sorry for running from you all. I'm sorry for making you chase me. I shouldn't have tried to hide the weed. I should have known better.'" X-ray vision: Officers "observed the offender sitting on the porch of an abandoned building. The [officers] also observed the offender holding a clear plastic bag in his balled up fist. The offender fled on foot. After a short foot chase the offender was apprehended. Prior to being detained, the offender placed a hand-rolled cigarette on the ground and stated, 'All I have is a blunt.' The [officers] recovered the cigarette and found it to contain a green leafy substance, suspect cannabis." The jaywalker: Officers "observed [offender] walking in the middle of the street impeding the flow of traffic. [Officer] exited vehicle and approached offender to conduct a [field interview]. Upon approach offender turned his body away from [officer's] direction and placed a unknown object from his right hand into his right front shorts pocket. [Officer] immediately recovered from said pocket 1 clear zip lock bag containing 19 smaller zip lock backs each containing a green leafy like substance suspect cannabis." The urinator: Officers "were on patrol in Sherman Park [and] observed offender urinating in public on park property. [Officers] approached offender. Offender could not produce valid identification. Officer conducted a search . . . and discovered 2 blunts containing a green leafy substance suspect cannabis in offender's right front pocket." Putting it bluntly: "While on routine patrol, [officer] observed offender walking west bound on 52nd Street near Paulina smoking a blunt. . . . During a field interview, [officer] asked the offender what he was smoking. The offender stated he was smoking a blunt. The offender was arrested and transported to [station] for processing." What one white guy had to do to get busted: "Offender taken into custody after being stopped for a traffic stop when he failed to stop at a non-working traffic signal. Prior to [officer] conducting a pat down search before placing subject in the rear of the squad car, offender verbally admitted to having marijuana in his possession. To wit, [officer] recovered a clear plastic bag containing crushed green plant (suspect cannabis) inside his right pant pocket." What another white guy had to do to get busted: "While on routine patrol, [officers] observed above subject approaching pedestrian traffic in area known for narcotic sales. [Officers] exited vehicle to conduct field interview and upon approach, offender removed right glove and numerous small ziplock bags fell to the ground. [Officers] recovered items and found them to be 7 small red tinted ziplock bags containing green leaflike substance, suspect cannabis." That week at the Cook County courthouse at 51st and Wentworth, dozens of people, almost all of them black men, went before a judge to face marijuana possession charges. Some of them ended up with fines and jail time. Yes, marijuana is illegal. Yet studies show—and come on, everybody knows—that it's widely used by all racial groups. By and large, however, black people are disproportionately getting busted for it. The ratio of black to white arrests for marijuana possession in Chicago is 15 to 1, according to a Reader analysis of police and court data. And by the time the cases make their way through the court system, the gap widens even further: the ratio among those who plead or are found guilty is 40 to 1. Here's another way to look at it: almost nine of every ten people who end up guilty of possessing marijuana in Chicago—86 percent, to be precise—are black men. The racial gap has become so glaring that Cook County Board president Toni Preckwinkle says something has to change, if only because taxpayers can't afford to continue arresting, detaining, and prosecuting low-level marijuana offenders. In an interview last week, Preckwinkle, for the first time, said what no other high-ranking local official has dared: "I think we should decriminalize possession of small amounts of marijuana, that's for sure." Preckwinkle added that she recently told Chicago police superintendent Garry McCarthy to "stop arresting people for small amounts of drugs, because you're wasting our time." McCarthy did not respond to our requests for comment on the racial disparity. Instead, a spokeswoman e-mailed a statement: "Crime and disorder issues emerge from a complicated web of social ills which law enforcement alone cannot correct." 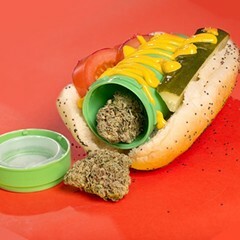 Chicago police made tens of thousands of arrests in 2009 and 2010 for marijuana possession, including 47,400 in which that misdemeanor was the most serious charge. So how egregious are the racial discrepancies? • Of those arrested, 78 percent were black, 17 percent were Hispanic, and 5 percent were white. 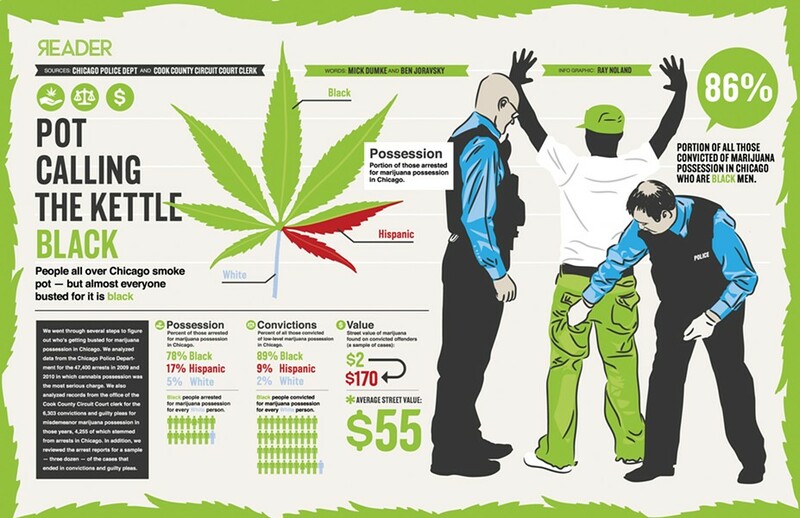 • In those years 4,255 people pleaded or were found guilty of low-level marijuana possession after being arrested in Chicago: 89 percent were black, 9 percent were Hispanic, and 2 percent were white. 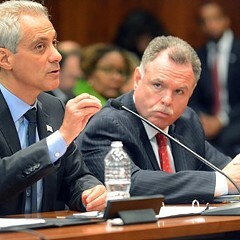 • The racial gap was slightly smaller for all of Cook County, which is less diverse than the city: countywide 76 percent of the 6,303 who were convicted or pleaded guilty were black, 10 percent were Hispanic, and 14 percent were white. • Blacks accounted for most of the marijuana convictions and guilty pleas out of every police district in Chicago except three on the northwest side: Shakespeare (which is in Logan Square and West Town), Albany Park, and Jefferson Park. Hispanics ranked first in each of these areas. • After Chicago, the most pot convictions and guilty pleas came out of west suburban Maywood, followed by Bellwood (west), Evanston (north), Cicero (west), and Harvey (south). • The street value of the pot found on the convicted offenders, according to our sample of case files, was anywhere from $2 to $170. The average was $55. There are conflicting explanations, benign and otherwise, for the phenomenon. Many cops contend it's just good policing strategy to use whatever tools they have to get bad guys off the street. They say it's an example of the so-called broken windows theory of law enforcement—cracking down on quality-of-life offenses to maintain a sense of control in high-crime neighborhoods. 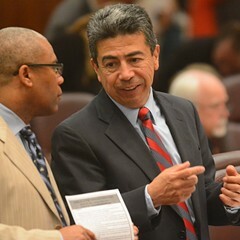 The strategy predates McCarthy's arrival in Chicago this spring, but he told aldermen in his confirmation hearing that it would be a central focus of his tenure. "I am an absolute advocate for enforcing the little things to prevent the big things," McCarthy told the aldermen. "Crime is very personal. Everybody who passes a group of kids drinking in the park, everybody who hears a loud radio becomes a victim of that offense. That contributes to a sense of lawlessness. People remember that and it resounds with them." Those minor crackdowns are also a way police can demonstrate to neighborhood residents that they're actively attacking crime problems. During monthly community policing beat meetings, officers review their arrest totals, often highlighting busts of people caught smoking pot in parks or other public spaces. Police and many judges say these arrests are popular among the residents of high-crime neighborhoods. In fact, some arrests are the result of information passed on from concerned citizens. For instance, last October police, alerted by "citizens at a recent CAPS beat meeting," went on patrol "in a known narcotics selling area" near 57th and State, according to a police report. There they found a 32-year-old man "engaged in conversation" with two other black men. As the police approached, one of the men shouted "Be up! ", which the cops described as "a known street term used to alert persons who may be committing street crime that police are in the area." Police said they conducted a pat-down of the man and found "several small zip lock bags containing a crushed plant substance" in his shirt pocket. Cops also say they use pot possession laws to snag drug dealers or violent gang members they haven't caught for more serious offenses such as gun possession. "What it can get us is gangbangers," says a watch commander in a high-crime district. "When that guy is sitting in lockup, he's not on the street being a target or doing other things." Adds another veteran beat officer who's worked in a number of tough districts: "There's money to be made selling weed. People say it's just weed, which is true, but there's a lot of money changing hands, and that's driving some of the violence. So does it help to lock guys up for this? It does, if he's a dealer." In short, the official explanation is that police aren't picking on black people—they're targeting lawbreakers in high-crime areas that happen to be black. However, many police officers concede that it's more complicated than the official explanation. In some cases, a lot of cops don't know the difference between the big-time dealers and the little guys who are carrying pot for themselves—they haven't been attached to the beat long enough to get to know people or they simply haven't bothered. A more experienced cop can differentiate between the two. "More often than not, you've got a guy coming home from work with a blunt," says the beat officer. "I'll tell them, 'Dude, smoke this in your yard or your house. Be smarter about it.' Now if it was Joe the drug dealer, I have no problem taking his car or his weed and letting him prove that the $5,000 in cash came from non-drug-dealing means. That's great. But if I take some guy's car away and he's a father of four and he can't get to work, are we solving problems? No." In other cases, cops make pot possession arrests for reasons that aren't part of any high-minded crime-fighting strategy—the same way they "give tickets to everyone on the whole block for parking on the curb," says the beat cop. "That's how some cops show their bosses they're busy. I think the same thing happens with weed." Plus, says the watch commander, there's another incentive: "The officer gets paid overtime to go to court." In addition, the officers say, the city is happy to collect fines from people caught with pot. "It's taxing people who smoke weed," says the beat cop. "If I bust you while you're driving a car, it's $1,200 bucks [to get the car back]. If you can't pay we take your car and sell it. So honestly, it's a way for the city to make money." Ironically, though, many police admit that the costs of enforcing the marijuana possession laws far outweigh the gains. "It's such a waste of manpower—you stop somebody and a nickel bag falls out," says the watch commander. And if the police take time to make an arrest and file a report, "they're not on the street responding to other calls." The arrests aren't helping with neighborhood relations either. "I think it's a travesty because there are bigger things going on in the community, such as violence," says Jimmy Simmons, a community policing facilitator in the west-side neighborhoods of Humboldt Park and East Garfield Park. Simmons says too often police simply stop and search men who appear to be minding their own business, which breeds distrust throughout the community. "It's almost like racial profiling. The young men we try to talk to, they feel they're being picked on, and I tend to agree with that." Indeed, police reports show that many black offenders were arrested after officers on patrol in a "high narcotic area"—the phrase is used again and again—saw someone they decided to search, often for no stated reason. Typical was the arrest of a 29-year-old man on the west side on September 8, 2008. "While on routine patrol in a high narcotic area," the arresting officers "approached the above for a field interview." They did not offer any reason why. When the police approached, the man reportedly "dropped to the ground 7 small zip lock bags all containing a green crushed leafy substance." The officers estimated the value of the marijuana at $70. The man was unarmed and denied any gang affiliation. He spent a day in jail and in January 2009 pleaded guilty to a misdemeanor possession charge. Frank Edwards has a name for cases like this. "We defense lawyers call it 'The Story'—'the guy was standing on the corner, I drove down the street at 30 miles an hour, I came within 10 feet, and he dropped it,'" says Edwards, a former Cook County prosecutor and judge who has been in private practice for the last 15 years. It's fair to say Edwards questions the veracity of these narratives. "People are so stupid that they pull drugs out of their pockets and throw it onto the ground in front of the police," he says facetiously. "At least half the cases are like this." Public defenders have their own terminology. "It's called a drop case," says Patrick Reardon, the county's first assistant public defender. "We looked at the subject, and as he looked at us he reached into his pocket and dropped a bag on the ground with a green leafy substance'—I've heard this thousands of times." In other cases, they note, the story involves officers pulling over a car and discovering marijuana on the seat. Reardon and Edwards believe the police have carefully constructed these narratives to avoid mention of a search. If the police claim the drugs were dropped to the ground or left in plain view, the question of whether the search was constitutional is moot. Then the defendant can only fight the charges by arguing the cops weren't telling the truth. "Most judges don't require anything other than the policeman saying he saw you smoking marijuana," says Edwards, whose father was a cop on the south side. "Almost every case with a gun or drugs nowadays is 'in plain view.'" By and large, these kinds of arrests almost never happen outside of black neighborhoods. In fact, when white people are arrested for marijuana possession, it's generally after police have stopped them for doing stupid things like running a stop sign while smoking a joint or attempting to buy drugs in a black area. Again, police say they're not singling out black people or giving white people a pass—it's just that whites tend to live in lower-crime areas. Defense lawyers say police wouldn't dare treat whites the way they treat blacks. "I would say that police tend to look upon drug sales as an inner-city operation, and because of that they tend to come up and harass and bust people in a neighborhood where they suspect drug sales are being made. You don't find that as much in River Forest," Reardon says. "It's just a different mentality in those neighborhoods." Or, as Edwards puts it: "People in middle-class white neighborhoods don't get their cars pulled over and searched." The penalties for getting busted can be costly. Though most low-level marijuana cases are thrown out, possession of less than 30 grams is a misdemeanor offense punishable by up to a year in jail and $2,500 in fines. People caught with more than 30 grams (roughly an ounce) face felony charges, as much as 15 years in prison, and up to $25,000 in fines. Plus there's the wear and tear of a night or two in jail for those who can't afford to post bond. "We've got too many in jail already," says Betty Swanson, a longtime block club and community policing leader in Auburn-Gresham. She says her neighborhood continues to struggle to contain "crazies" responsible for deadly gun violence, but the low-level pot busts aren't helping the cause. "Catching them smoking it and locking them up isn't going to help us. In jail they're not getting any help or learning anything that will do any good." Swanson and other activists want the police to stop making so many marijuana arrests, but Superintendent McCarthy's position on the issue is not clear—at times he's argued different sides of the same issue. Cook County state's attorney Anita Alvarez, whose office is responsible for prosecuting the cases, puts the onus on McCarthy and the police. "We handle the cases that come in," she says. "As far as any specifics as to how people are getting arrested, that's not a question for me—that's a question for the police department." Furthermore, Alvarez says she is not about to join the call to decriminalize marijuana, though she would be open to "sitting at the table" for a discussion of drug policies. "If the state wants to legalize marijuana, well, that will be the law, but it's not a discussion we've had here." That leaves Preckwinkle as the only prominent elected official in Chicago speaking candidly about the matter. In June she spoke at a downtown rally decrying the 40-year-old war on drugs as a failure. No other elected officials showed up. In our interview, Preckwinkle noted that it costs taxpayers $143 a day to house someone in the Cook County jail. "The drug policies in this country are stupid and extraordinarily expensive," she said. When asked why marijuana laws have such a disproportionate impact on blacks, she simply said: "Poverty and racism." Still, Preckwinkle says she realizes if anything builds support for changing marijuana and other drug laws, it's likely to be the cost to taxpayers of arresting, detaining, and incarcerating users. "If you have no compassion for the people in the criminal justice system or their families or the communities from which they come, and all you care about is the money, I'll take you as an ally any day." E-mail Mick Dumke at mdumke@ chicagoreader.com and Ben Joravsky at bjoravsky@chicagoreader.com. A trip to Denver shows the promise of legalizing pot.